So you've lived in your place for several years now and you aren't ready to do a major design overall, but you've still got an itch to change things up — so, what do you do? 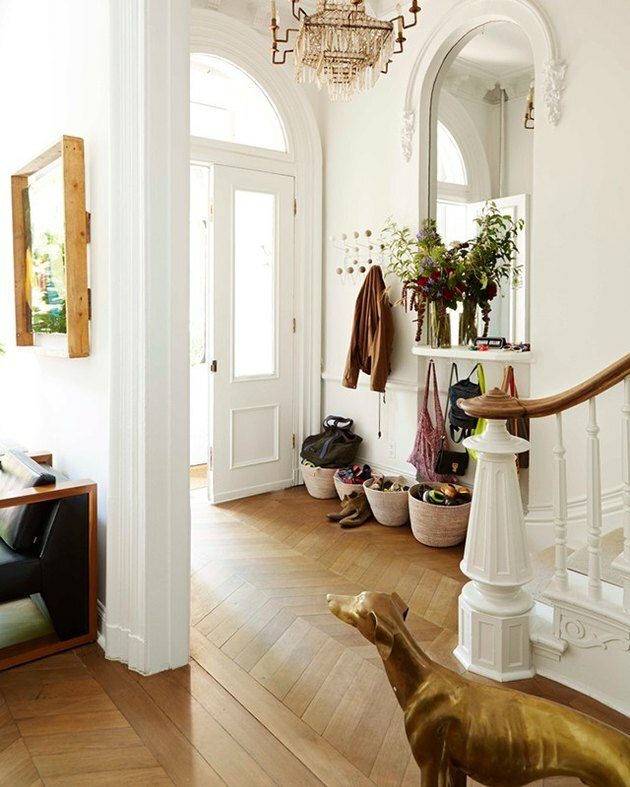 There are a lot of small decor changes that you can make that will totally reinvent your home. 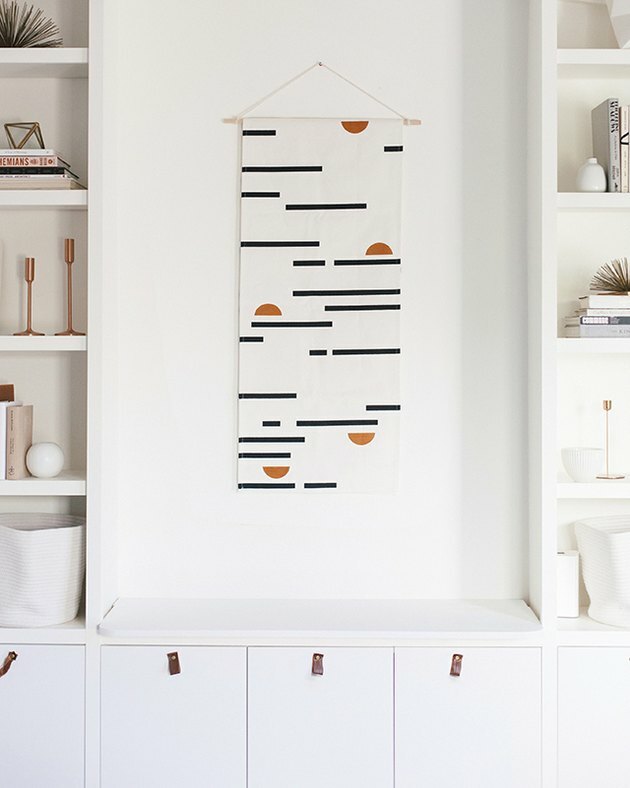 Some of these updates, such as styling your bookshelf, can be done right now; while others involve a little more time and effort, like completing a fun DIY project or purchasing a must-have piece of decor that has transformative powers. Either way, here are 13 fun and easy decor adjustments that will make your home feel brand spankin' new. 1. Add some leafy greens. 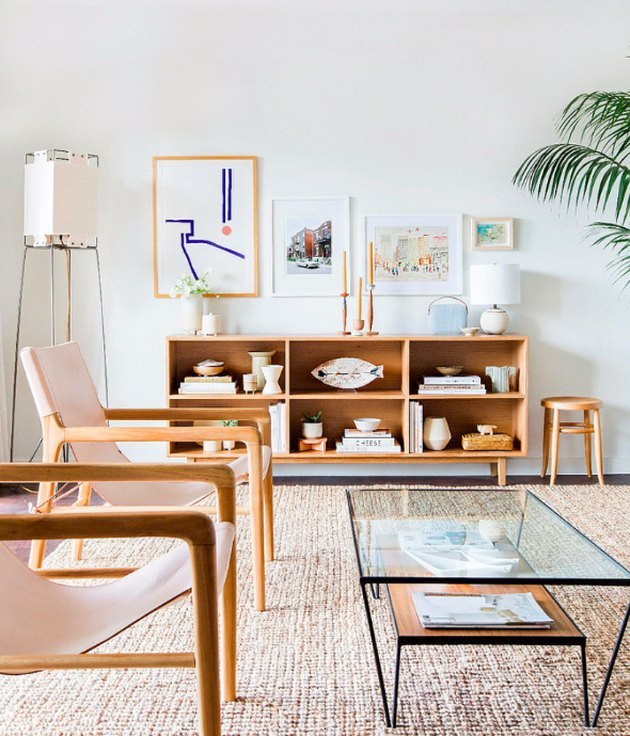 Greenery is a lovely way to bring a bit of nature into your home, and air plants are the latest incarnation of the outdoors-inspired trend. 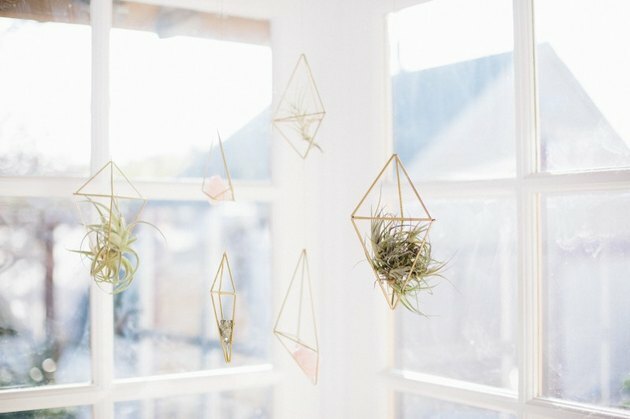 Lucky for us, Mr. Kate has a great DIY for building your own air plant hangers. Pro-tip: When choosing air plants, consider plants and containers that only need a daily mist of water to stay alive. 2. Hang a room divider. Room dividers can take many different shapes and sizes, ranging from drapery, to folding screens, to bookcases. Whatever method tickles your fancy, adding a room divider is a great way to demarcate your space while adding a little bit of privacy. 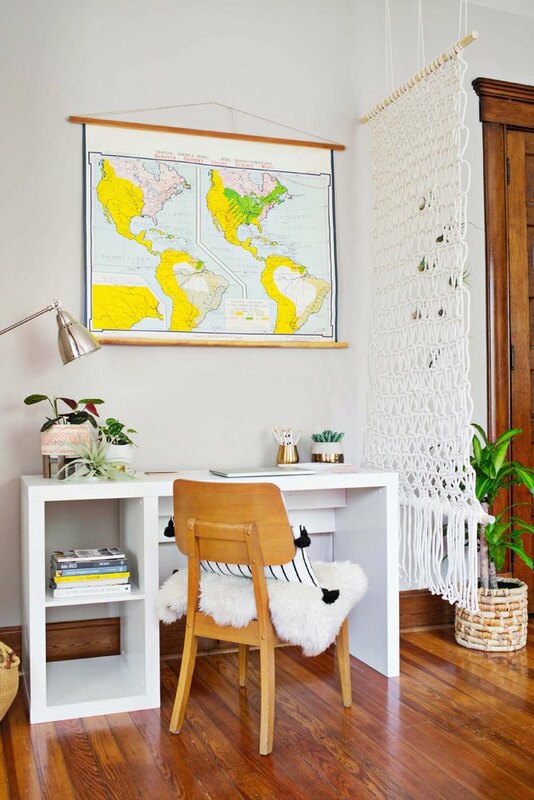 You can even make your own macrame room divider with this crafty DIY project. 3. 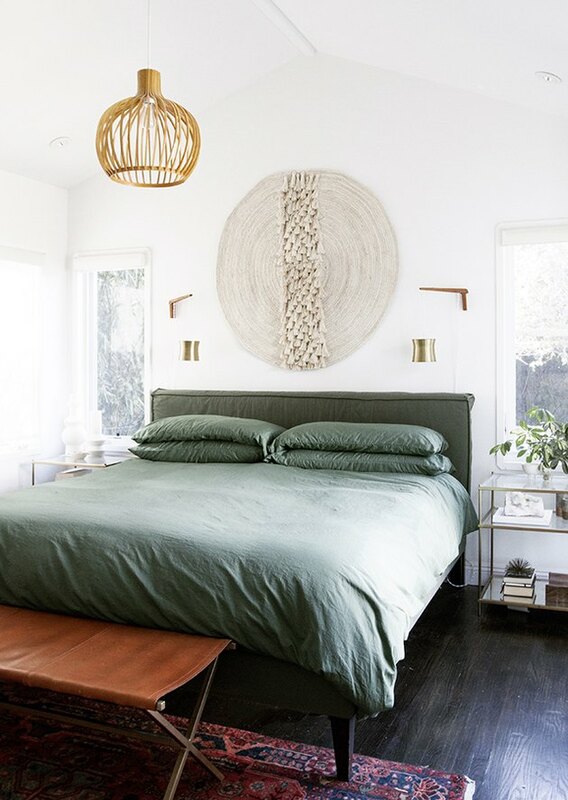 Upgrade your bedroom lighting. Oftentimes, when we makeover our home we forget about the bedroom. "Oh, it's just me in there," we say, but that is even more reason to give your sleeping quarters a fresh redux from time to time. A fast and easy way to go about making a few adjustments: update the lighting. Try adding a beautiful pendant light or sleek chandelier for an illuminating change of scenery. 4. 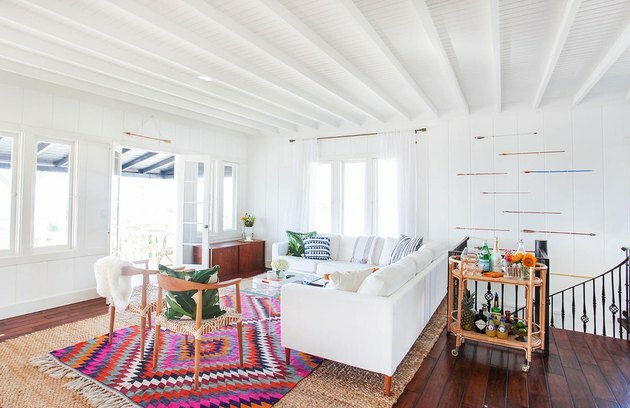 Throw down a bright area rug. Give your living room's chic all-white color palette a pop of color. 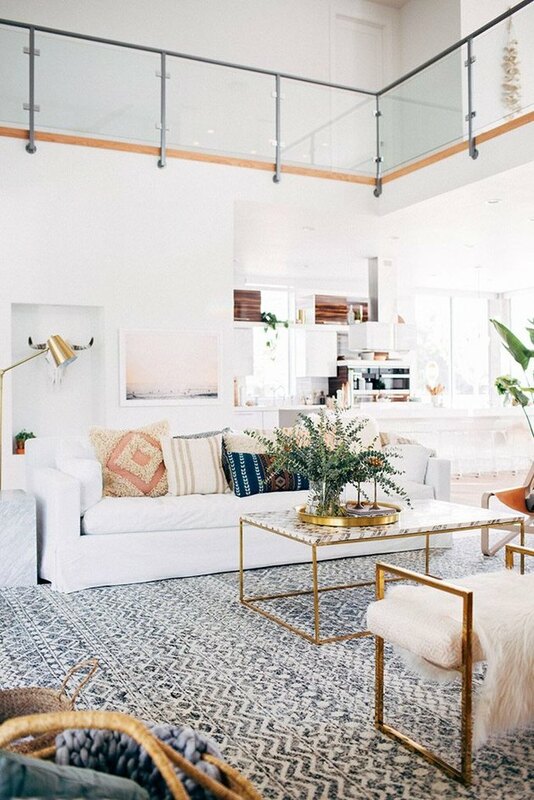 Add a bright, multi-hued area rug to your monochromatic space to warm things up. 5. Upgrade your throw pillows. If your sofa doesn't already have throw pillows, then your living room is in for a treat. Spice things up with fun, funky, or eclectic throw pillows that incorporate different textures, patterns, and accent colors. Maybe you have a framed wedding photo, but what about all of the candids, the Instagram pics, and the photo booth scrolls? It sounds simple, but don't forget to personalize your home with photos from your life — you don't even need expensive frames. 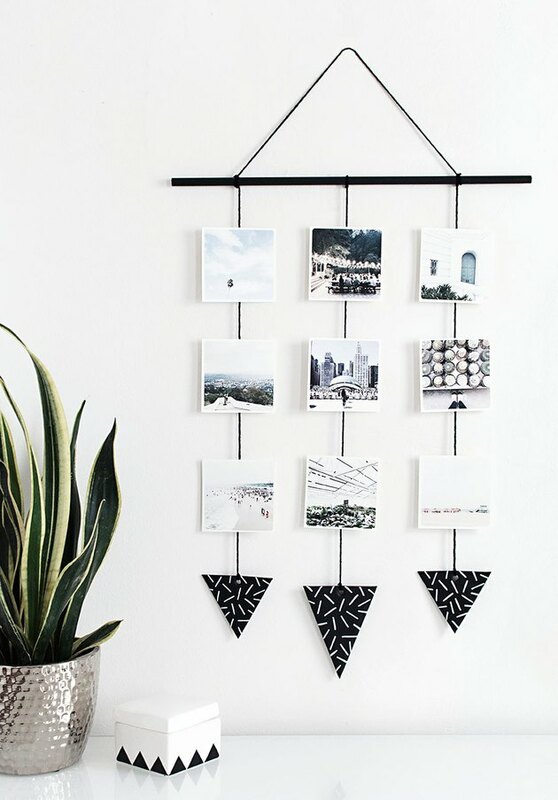 Try a fun DIY project like this hanging photo wall. It's easy, inexpensive, and adds a cool personalized aesthetic. 7. Turn a table runner into a wall hanging. When interior designer Sarah Sherman Samuel bought a table runner for Thanksgiving and then never used it again, that's when lightning struck. Instead of letting it sit in a cabinet collecting dust, she devised a beautifully creative way to give it new life. Samuel says, "I simply used a wooden dowel, folded the runner over the dowel and tied yarn to each end and done!" 8. Use baskets as storage. What are you currently using for storage? Giant plastic bins? Cardboard storage boxes? Whatever your preferred method of storage, consider using baskets instead. Woven baskets are an aesthetically pleasing yet inexpensive way to store all of your odds and ends. Give your bookcase a fresh facelift by simply reorganizing. 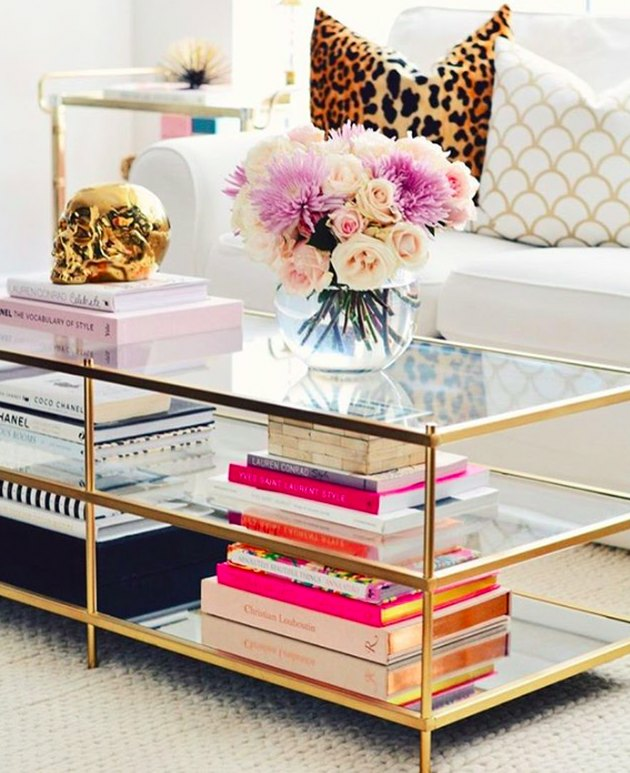 Switch things up and add a little variety — lay a few books horizontally, stack some vertically, incorporate candles, vases, and other decorative accents. 10. Create a gallery wall. If you already have framed photos and artwork around the house, then this is just a matter of rethinking and repositioning. 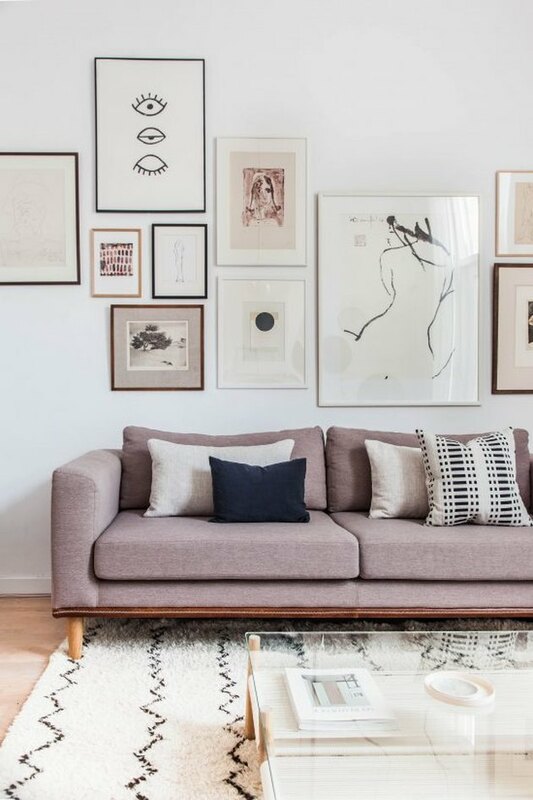 Before you begin your statement-making gallery wall, arrange your gallery template on the floor. Then, take a photo of your well-planned arrangement to use as a guide. If you really want to change the look, and more importantly the feel, of your bedroom, buy some new sheets. 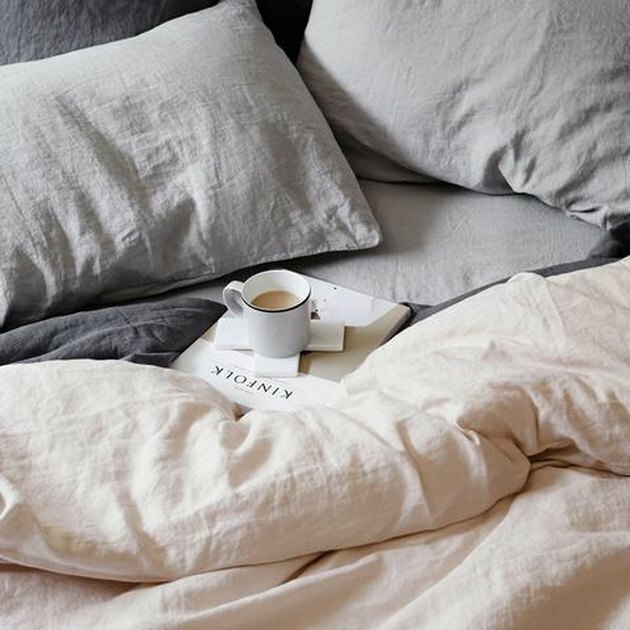 Try crisp, all-white bedding like you might see at a swanky hotel, or opt for something a little moodier like charcoal linen. 12. Throws can switch up an old sofa or chair. A cheap and quite possibly the fastest way to change the look of your living room is to add a throw. 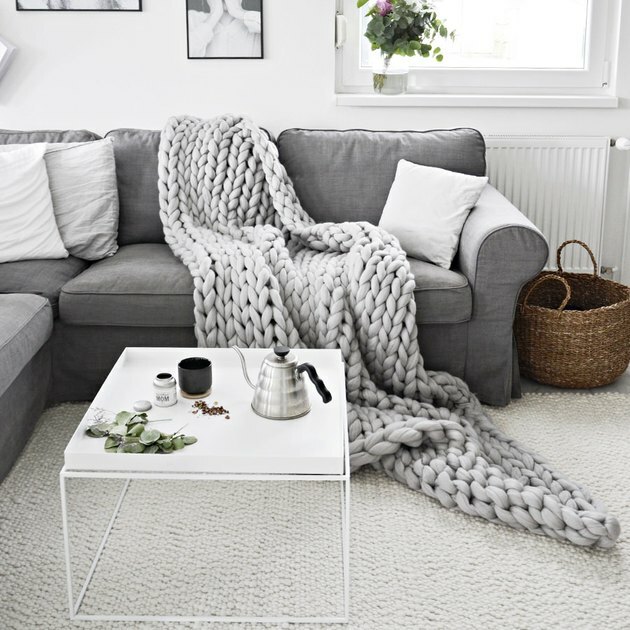 Cover an old chair with a sheepskin fur or add a chunky knit blanket to the back of your sofa. This layered look is a great way to add texture and revamp an old piece of furniture, not to mention — it gives you something soft and warm to cozy up to on lazy afternoons. 13. Color coordinate your coffee table. Turn your coffee table into a mini library. Reorganize your books by color, size, stack them horizontally, or use them as a base to display your favorite tchotchke or vase.